Site compatible with everything except IE 7/8. 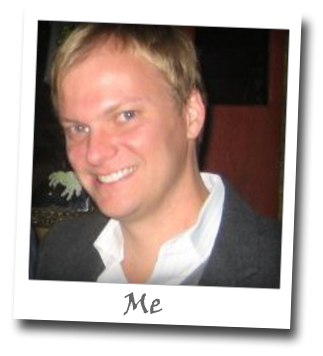 Welcome to the personal website and portfolio for Chris Kobler, a visual designer, developer and marketing professional who currently resides in the Dallas/Ft. Worth Area. I'm a graduate of the University of Texas at Arlington, where I received my Bachelor's of Fine Arts in Graphic Design in 1999. My professional experience has allowed me to work with clients such as Southwest Airlines, Fossil, Pizza Hut, Pepsi, Mountain Dew, AMP Energy Drinks, Hewlett Packard, WingStreet, 24 Hour Fitness and Samsung. My past work experience includes Fossil, Match.com, Ericsson, Verizon SuperPages and Eurordis of Paris, France. view resume. In my spare time, I serve as a proud member of the Dallas Junior Chamber of Commerce, Texas Young Professionals, Lee Park Junior Conservancy and the Dallas Society of Visual Communications. For fun, I like to run, play volleyball and travel every chance I get. Thanks for visiting! If you would like to contact me, please feel free to leave a brief message. 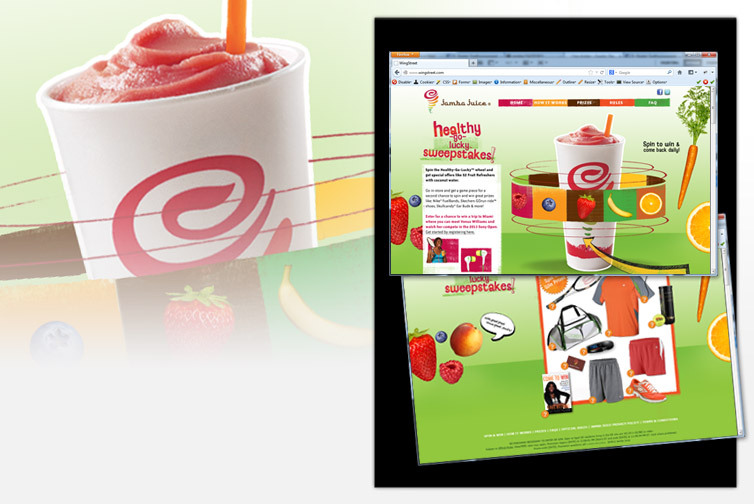 This sweepstakes site for Jamba Juice featured registration, integration with database and flash components. 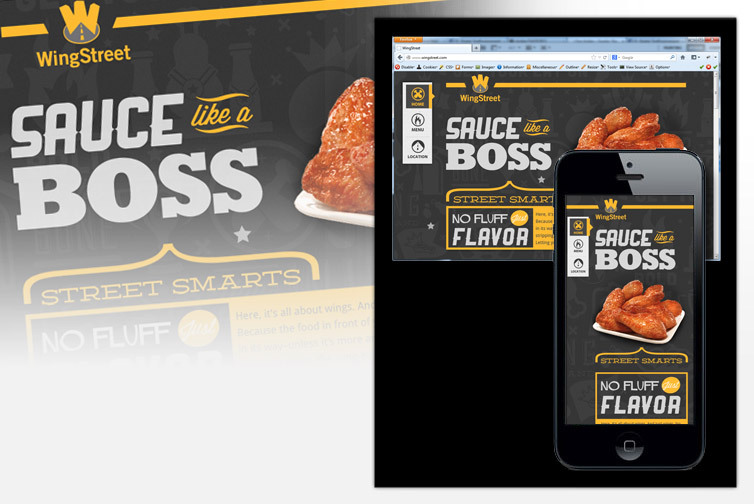 I developed the site personally with HTML, CSS and jQuery, and worked with a team to integrate with PHP and Flash. 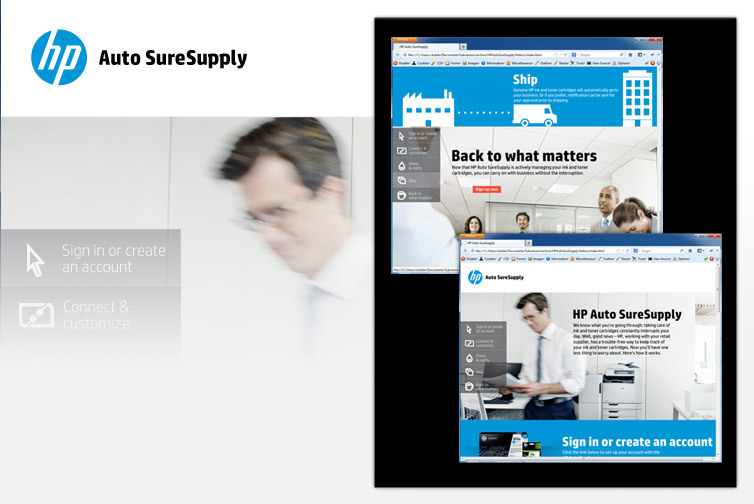 This mini-site was created for Hewlett Packard printing services, and features vertically scrolling navigation. I developed the site personally with HTML, CSS and jQuery. This mini-site was created for a partnership between Walmart and T-Mobile, and featured a responsive design. I developed the site personally with HTML, CSS and jQuery. 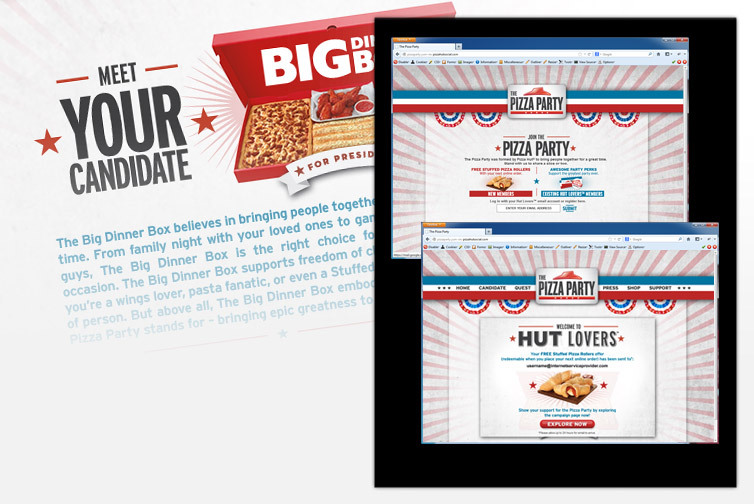 This website was created for Pizza Hut as a fun election year tie-in where users can register as a Hut Lover and vote for the candidate of their choice. I developed the site personally with HTML, CSS and jQuery. 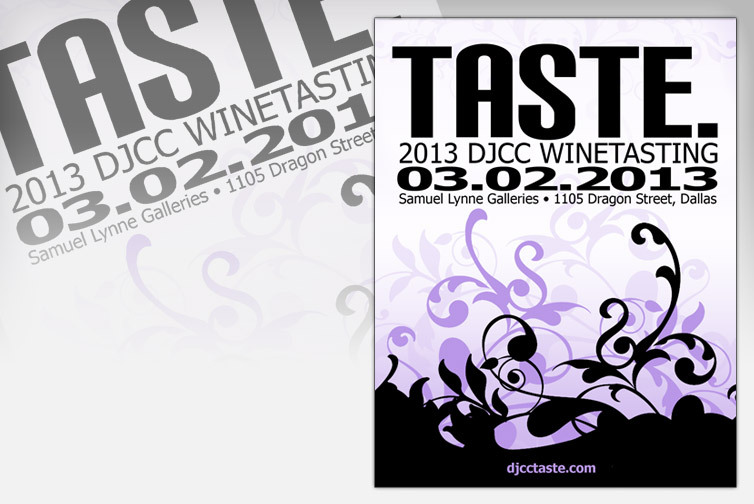 This poster was designed to advertise TASTE: The 2013 Wine Tasting, hosted by the Dallas Junior Chamber of Commerce. I designed this using Photoshop and Illustrator. 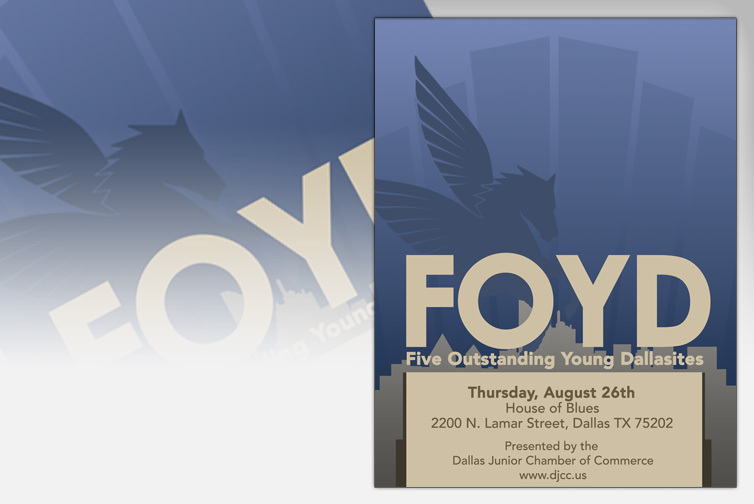 This custom designed poster was created to announce the 2010 Five Outstanding Young Dallasites Gala, honoring local professionals who have excelled in their community. I designed this using Photoshop and Illustrator. 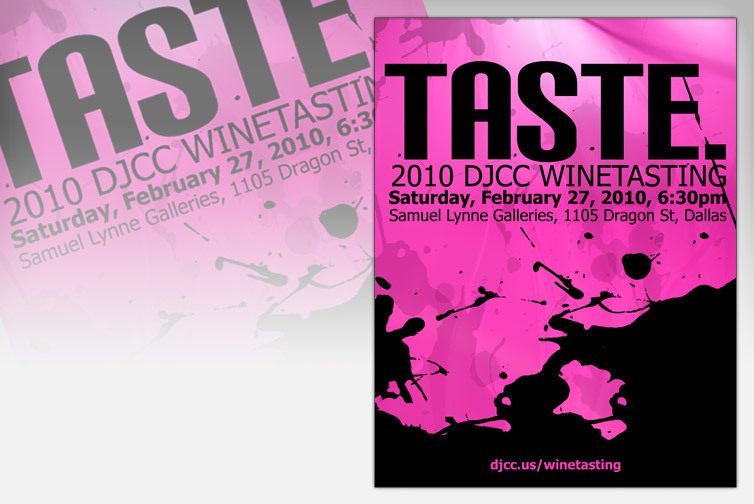 This poster was designed to advertise TASTE: The 2010 Wine Tasting, hosted by the Dallas Junior Chamber of Commerce. This charity event drew more than 400 young professionals in the Dallas area. I designed this using Photoshop and Illustrator. This is a small sampling of the many logos I've created using Photoshop and Illustrator. This short music video was created as a class assignment and features animated hand drawn line art, and is set to a rockin' music beat. Created with Photoshop, Illustrator, Flash and ActionScripting. Visit video. 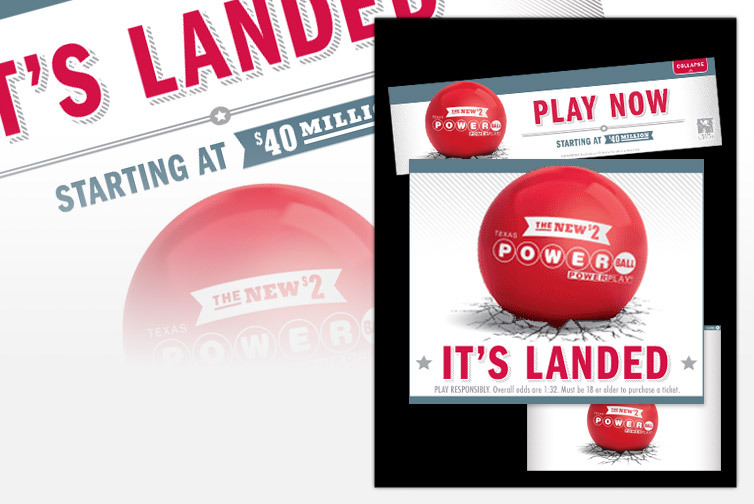 These banners were created as part of the Texas Lottery PowerBall campaign, and included site takeovers and expandable/collapsable Flash banners. Created in Photoshop and Flash. 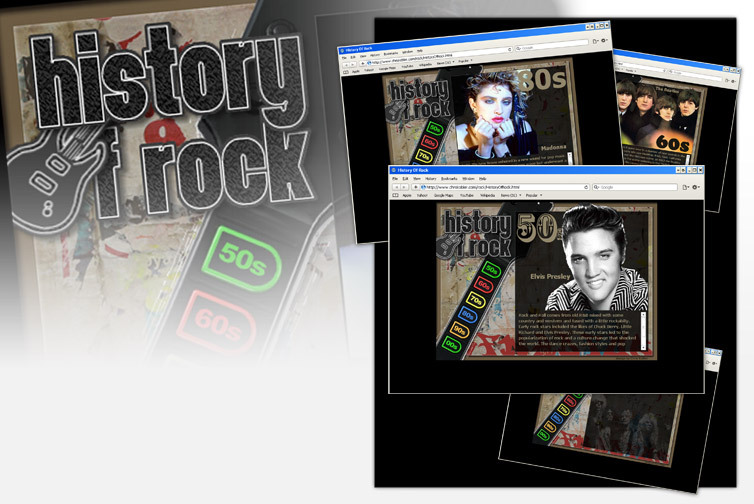 This interactive Flash piece was a class assignment that highlights details from the history of rock music. Created with Photoshop, Flash and ActionScripting. View Video. This hybrid HTML/Flash website featured animated animals, moving clouds and flying birds. I built the site with HTML, CSS, jQuery, Flash and ActionScripting. This Facebook app was created as a regularly updated Facebook Application that allows a user to "like" the page in exchange for exclusive offers and discounts for Hut Lovers members. I created this app with HTML, CSS and jQuery. This Facebook app was created for the Amp Energy "Summer Hook Up" Instant win game which allows users to connect and register through Facebook, enter a scratchoff code and win prizes. I created this app with HTML, CSS and jQuery. 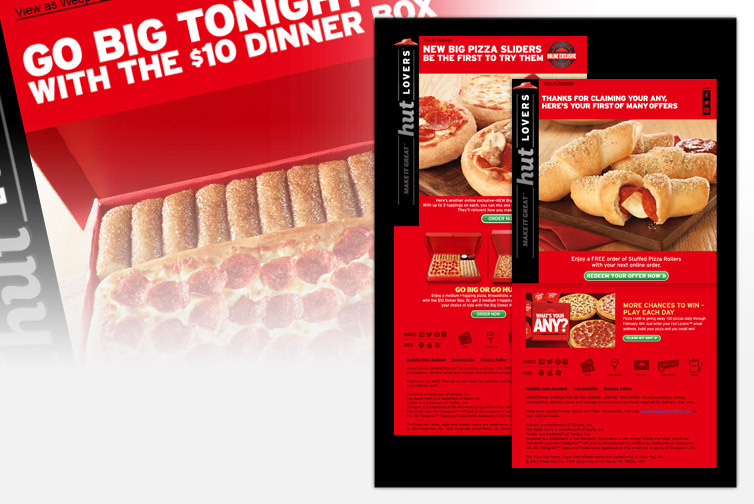 I personally built and deployed all of the Pizza Hut National and Segmented Hut Lovers™ Emails to a distribution list of over seven million members. Emails were tested through Responsys, and deployed through Exact Target. 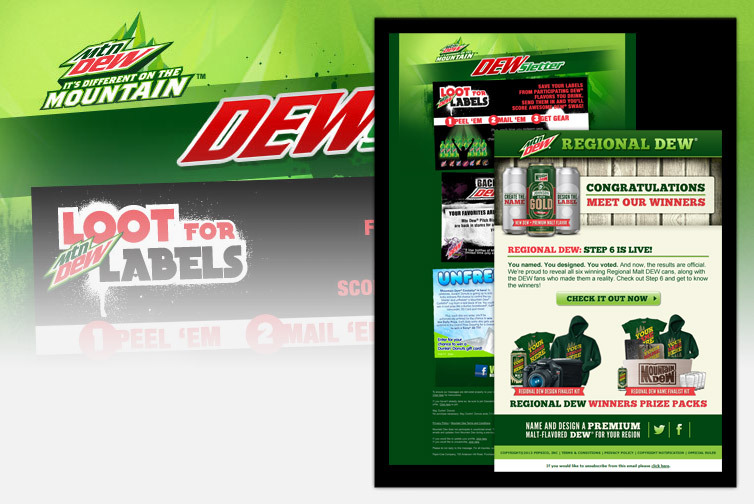 I personally built and optimized several Mountain Dew Dewsletter emails. Emails were tested through Responsys, and deployed through Exact Target. 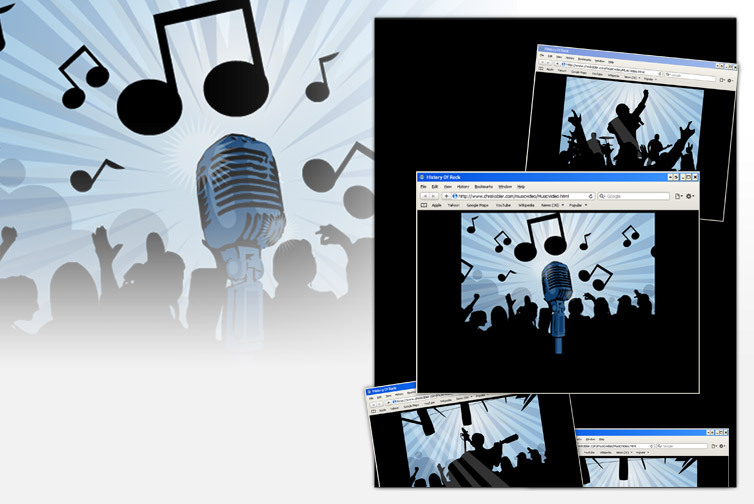 View example email. Managed brand websites for Nobilis Health, North American Spine, Migraine Treatment Centers of America, and other medical brands. Integrated forms with our proprietary CRM for capturing patient data, and producing leads. Used Optimizely for A/B testing of landing pages, and various tracking plug-ins and applications for capturing site traffic and metrics. Managed off-shore resources and assigned tasks through the ACE Project Management system. Utilized emerging technologies including Bootstrap, LESS, Git and WordPress. Responsible for the creation of marketing and triggered emails including, but not limited to: design, HTML manipulation, all content completion, segmentation implementation, testing implementation, quality control, routing for approval, final testing and deployment through the Responsys email execution system. Worked with Marketing, Creative and Development Teams to produce engaging and compelling promotional emails for the Fossil Brand, as well as the Fossil Portfolio Brands, which includes Adidas, Armani Exchange, Burberry, Diesel, DKNY, Emporio Armani, Karl, Marc by Marc Jacobs, Michael Kors, Michele, Relic and Zodiac. 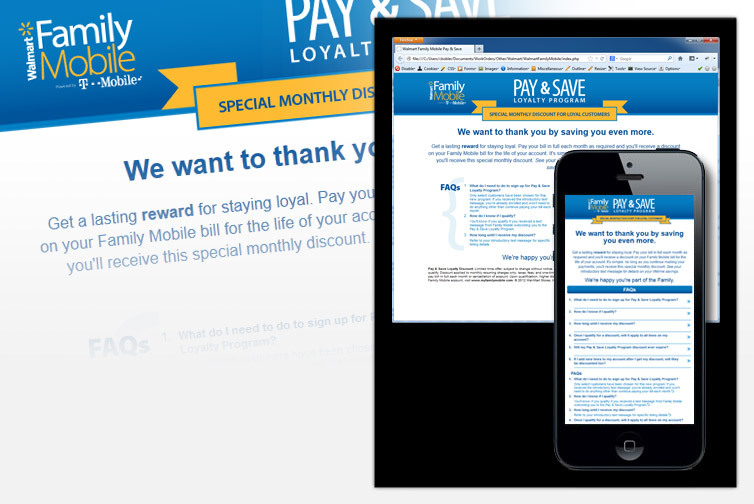 Provided consultation and direction on email marketing directives including a push towards responsive design for better rendering across mobile devices and ESP's, dynamically driven content based on list segmentation and consumer spending habits and preferences, and provided sharable content and increased interaction with social media channels. Provided metrics to support the marketing department's direction and initiatives by capturing historical and performance data through the Responsys deployment tool, Litmus, Return Path and other resources. Established programs and campaigns within the Responsys email deployment tool to trigger automated emails to guide the customer through a customized user experience. These triggered emails include Welcome Emails, Abandoned Cart Notifications and eReceipts. 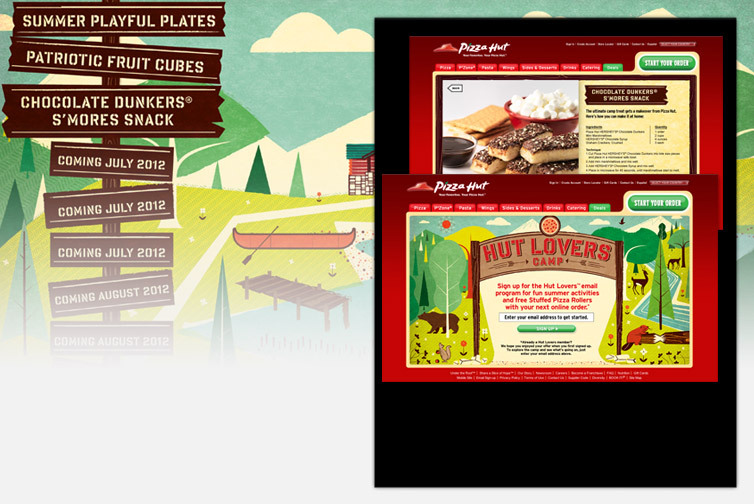 Personally built and managed the production of all Pizza Hut CRM email campaigns and Hut Lovers™ newsletters with a regular circulation of over seven million recipients. 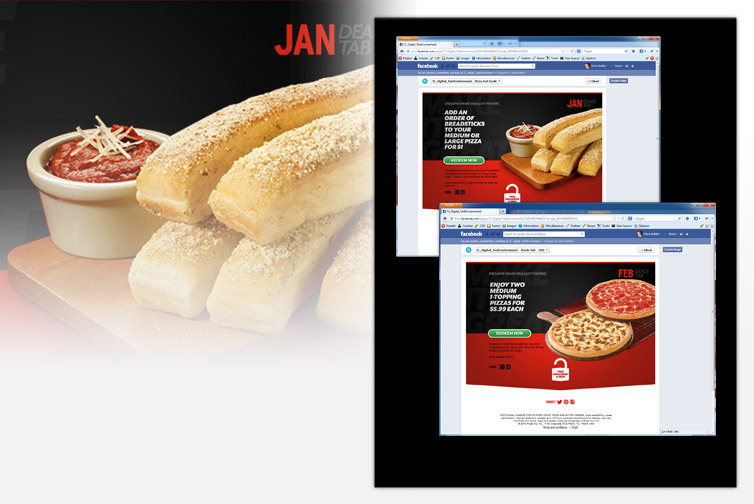 Produced all social media applications for Pizza Hut promotions and special offers including integration of Facebook Applications with full social share capability. Oversee the complete life cycle of promotional materials on our Content Production system from ideation, inception, development, testing and deployment. Manage the Content Production system that controls the flow of all promotional landing pages, Index Pages, marketing pages and affiliate content through partners such as MSN, Yahoo! and AOL. Work closely with product managers to determine the direction of new features, establish business requirements, functionality and user case scenarios. Visual design and development of online collateral for match.com utilizing Dreamweaver, Photoshop, Microsoft Visual Studio and Microsoft Visual SourceSafe. Develop marketing and email campaigns to drive traffic to site and increase registrations. Responsible for establishing test user accounts to validate work in QA test environment before pushing code to production. Served as primary contact for sales force and external customers on SuperPages products and Internet services. Personally designed and produced Websites for small to medium sized businesses throughout the United States with placement options for Verizon SuperPages online business directory using Photoshop and Dreamweaver. Assumed the role of project manager for the new site, meeting regularly with the CEO, Board of Directors, and technical consultants to deliver a product that best suited the company and their needs. Developed a working prototype and established the information architecture for the Eurordis Web portal on rare diseases, which is funded by the European Commission and aims to connect patients with patient organizations. Assisted in the translation of documents using SYSTRAN software and proofreading of outgoing communications. Conducted a feasibility study and provided technical consultation on various aspects of the new site. Preparation of collateral using Microsoft Word and Excel, as well as Powerpoint Presentations. Oversaw the production of the quarterly newsletter. Responsible for the concept and creation of graphic user interface design for both internal Websites contained on the Ericsson Intranet and external business to business applications. Designed and launched Ericsson eBusiness Solutions departmental Website with no assistance. Features include Flash interface and interactive portfolio. Streamlined and enhanced ESROA Latin America site to improve communications between branch offices throughout Central and South America. Redesigned Richardson Financial Services Website to include original graphic user interface, and enhanced features of site with regards to navigation and structure. Assisted with the production of graphic user interface design of such business to business applications as Microelectronics RepWeb and MCI Worldcom project. Conducted Regular maintenance to various internal sites including Data Services, Human Resources, and Security. Organization focuses on business networking and philanthropic projects in our community by volunteering and fundraising for several charitable organizations. Planned, organized and executed monthly membership meetings, board meetings, managed finances, and oversaw the various planning committees for each of our signature events. Planned monthly membership meetings, secured guest speakers and oversaw our various committees responsible for organizing our signature events. Oversaw the various planning committees for each of our signature events, including our charity wine tasting, Five Outstanding Young Dallasites awards presentation, and the Rookie of the Year awards banquet for the Dallas Police Department.